Soft pretzels aren't just for food carts and concession stands. Make your own at home! I've never made "real" pretzels, but I've thought about it – and I gotta say, they seem like a lot of work. All that kneading dough, resting, boiling, then baking. There are a lot of steps, which could make a fun afternoon if you were baking with a group of friends, but let's be honest; it's a lot for one person! This is where our good friend the Pillsbury Doughboy comes to the rescue! Some people might call it cheating, but we'll just call it smart. Using one of Pillsbury's dough products, like Pizza Dough or Rustic French Bread, all you have left to do is open the package, unroll the dough and start making pretzels! Easy peasy, just how I like it! Start by preheating your oven to 400°F. While your oven preheats, roll out the dough, forming it into a rectangle roughly 18 inches wide and 12 inches tall. Cut the dough into long even strips, about 2 1/2 inches apart for a medium to large-size pretzel. If you want to make smaller pretzels, just cut smaller strips. Once you have your strips cut out, you can start rolling them into a long thin strip. Start by folding the strip in half and then rolling, this will allow you to make a long even strip of dough about 24 inches long. After rolling out the dough, grab each end bring them together like you're going to form a circle, then twist each end around each other twice, leaving about 2 inches of dough after the twist. Finish by flipping the twisted end over the bottom of the pretzel so the twist is in the middle of the pretzel, leaving those three classic holes in the pretzel. Press the overlapping dough together to help everything stay intact, and you're just about done! Place the pretzels on a greased baking sheet. 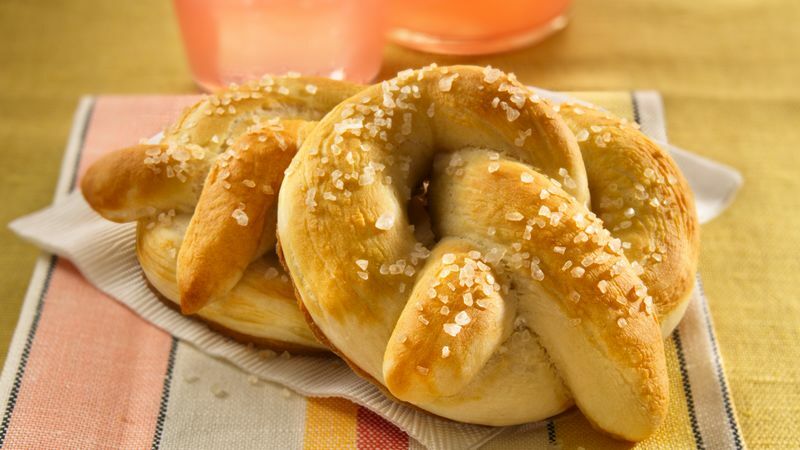 Brush each pretzel with an egg wash (1 egg whisked), then sprinkle coarse salt on the pretzel and place in the oven, baking for about 15-20 minutes until they start to brown. Although this is a very basic pretzel recipe, it's a great starting point for adding other flavors. If you really wanted to amp things up, you could sprinkle your pretzels with things like cheese or herbs, or even spread some pizza sauce and cheese on them before baking. The options are endless and delicious!